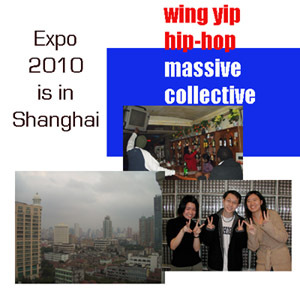 I was thrilled to be invited to the CD launch party of Wing Yip Hip-Hop Massive Collective's new album, which includes some guest appearances from some random foreigners who couldn't get away with such things anywhere else but the developing world. I'll SMS my friend / China is modern. from the song "Mobile Phones Are Wicked". The album is sure to fly off the shelves as if attracted by powerful magnetic forces. Also featured on this track are lyrics by American Ree-jekt, an expat who is unable to explain his presence. Whilst at the coffee shop, I (wo) overheard Mr Lim discussing arrangements for Wing Yip's April "Everybody Go Shopping - It's Fun and Modern" tour. Details were hard to get off the tight-legged manager, but promises that this will be the biggest yet (possibly including two shows) have really been getting the fanbase excited.